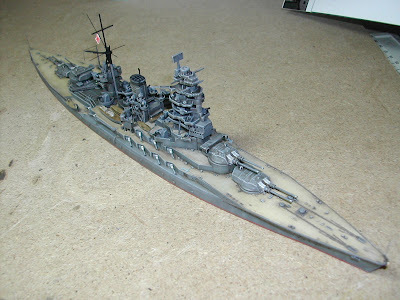 Regular readers will spot that I have not previously mentioned anything about a Japanese warship, but I have in fact been building one for some time. It has been the most engrossing forty-odd hours I have spent in a while, and I was too intent even to pick up the camera. This one probably counts as a leisure build, although it will go on sale soon. I've been working on it in the evenings and weekends, and I'm sorry it has come to an end. The build went really well, in spite of one or two perceived inaccuracies, but it was a terrific experience. What is it? It's the 'Nagato' of the Imperial Japanese Navy.